Using a MacBook Pro without a hub is not very practical. yinboti T3 Hub is designed to solve this problem. 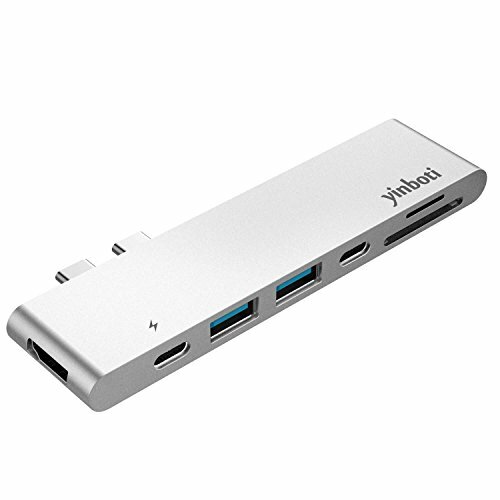 We took great care to design the yinboti T3 Hub in the same sleek and stylish design as that of the MacBook Pro. After all, you don't want the hub to stand out when using it. It is roughly the size of a portable USB flash drive, so it will easily fit into any bag. 9) Supported devices: 2016 & 2017 MacBook Pro 13 "& 15"
- Can not read drives with capacity greater than 2TB. - The normal operating temperature of the hub is about 40°C / 104F. ✔️ Designed for MacBook Pro 2016 and 2017, including 13" and 15". ✔️ Thunderbolt 3 port, USB-C port, 2x USB 3.0 ports, 4k HDMI (30Hz) video output and SD/Micro Card Reader. ✔️ Slim & compact - Easy to take the USB Type-C Hub anywhere. ✔️ Plug & play - No software and drivers installation. ✔️ Two type-c male plugs connect to Macbook Pro, strong and fast. If you have any questions about this product by yinboti, contact us by completing and submitting the form below. If you are looking for a specif part number, please include it with your message.